Three artists exploring the intersection of culture and the natural world in Raw and Cooked. 300 S. Rio Grande St. Since the first human creativity that could be classified as "art," visual expressions have been used as a tool to help people understand nature and the world around them, at least from an aesthetic point of view. But there is still this post-modern notion that the human eye alters the thing observed, so you can't really "see" the world free of the shadings of the human lens. 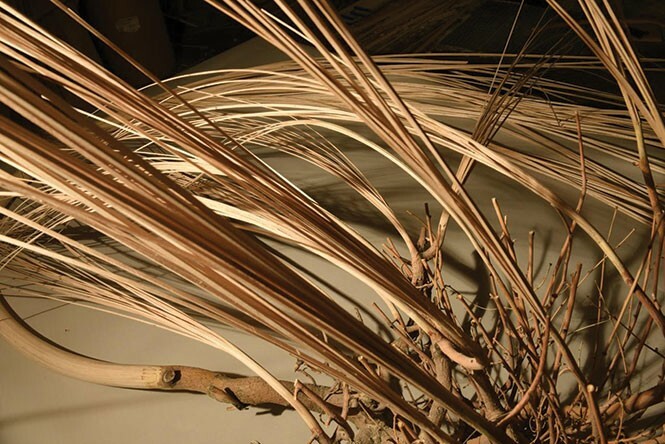 It is within this framework that Utah Arts & Museums' Rio Gallery kicks off the new year with an exhibit titled Raw and Cooked, about the intersection of nature and culture. The phrase "the raw and the cooked" originated in the works of French anthropologist Claude Lévi-Strauss in his 1964 book of the same name. In the volume, Lévi-Strauss looked at a number of everyday objects and experiences in various cultures, and how they play a role in the "culture/nature" dialectic. According to his theories, our relationship with objects is the foundation of myths—in the anthropological sense, cultural narratives to explain our place in the world. The artists in the exhibit Raw and Cooked use mundane objects and experiences to investigate the relationship between nature and culture. Paul Crow, Jim Jacobs and Josh Winegar, three faculty members of the Department of Visual Art & Design at Weber State University, have created very different works that relate to the theme, and they participate in a dialogue with one another and the viewer. Crow's "On Ice" is a series of large inkjet prints and text that look at the way ice has been culturally transformed from a substance that was on the margins of cultural awareness to something we pay intense attention to as an indicator of global climate change. At the same time, the photographic images resemble artistic abstractions, highlighting the ways that a substance, which can be physically threatening, even chilling, is also graceful and aesthetically beautiful, and an object of artifice. In his "Unnamed" series, Jacobs grafted natural tree limbs to pieces of milled lumber, and the results are aesthetically pleasing yet also slightly jarring. As sculptural works, there is an elegance and symmetry, and they are imposing and visceral. There is also an uncanny sense of the ways the segments are combined. Since the raw material is all natural, these "grafts" want to appear like natural growths, even though they are the product of the human act of grafting, and it's a kind of graft that isn't going to result in further growth. "Unnamed" evolved out of previous work by Jacobs, in which wooden objects were intertwined—and in many cases, built—around natural limbs. Winegar's "Corresponding" is the one series of works in the show that directly depicts humans confronting nature, in a number of photographs of hillside landscapes, some with people in them. These characters in the landscape appear anonymous, but in the natural setting, they attain a quality of contemplation that they perhaps would be unlikely to achieve away from it. Thus, nature is a place of discovery, both of the world and of one's self, but also the site of projection of our idealized notions about it. Crow explains the importance of the subject matter of the show: "The show is about the nature in us, and on a few levels disabuses us of the fallacy that we are somehow not a part of this world." Interestingly, all these works were already in progress before the idea for the exhibit germinated, so the show itself came together somewhat organically—its own natural expression. By this point in human history, it seems that culture and nature have, in some senses, traded places. The environment in which we find ourselves in the world is more and more artificial, a manufactured cultural product. And culture has almost been accorded the status of an organic phenomenon, at least in ways we speak about it, as in viral memes and other cultural phenomena. Lévi-Strauss might find it fascinating. Nature and culture could be at an impasse, a crossroads at which they are both possibly transformed. But the conflict, the tension, is still there, to be delineated and devoured, whether raw or cooked, by anthropologists and artists and anyone who cares about life on earth. The mythic narrative about culture and nature in these works is about the ways humans have altered nature for our own purposes, and attempted to shape nature in our image. These three artists give us some fascinating examples of ways to grapple with it. Jacobs says: "I think of the idea of nature and culture as a construct. They are really one. I believe we create this binary model to make sense of the world and justify our actions. Although we apply this dualistic perspective to many ideas, I believe these borders are gradually being erased."